On Monday, my girlfriend and I were sitting having dinner when a crazy thought slipped into the conversation: “Lets do something completely spontaneous and adventurous!”. It didn’t take more than three sentences to get to “Lets go camping!”. Once we had decided on the activity, we needed a location. 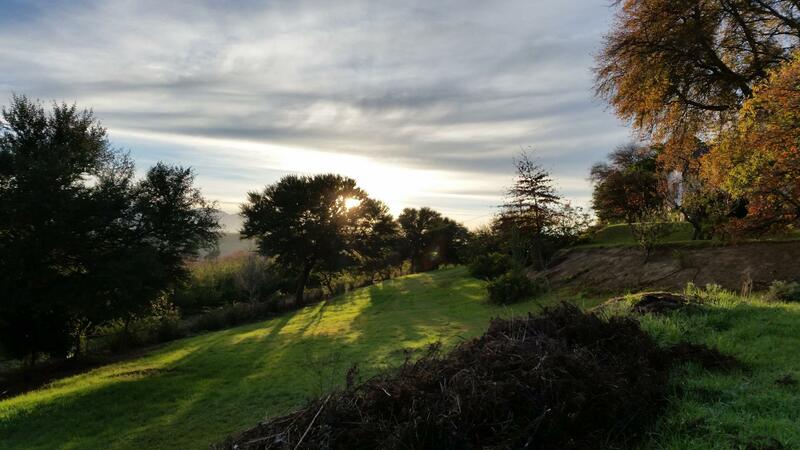 One of the most beautiful and peaceful places our country has to offer lies nestled in the heart of the Overberg. Elgin Valley is the Apple growing mecca of South Africa. 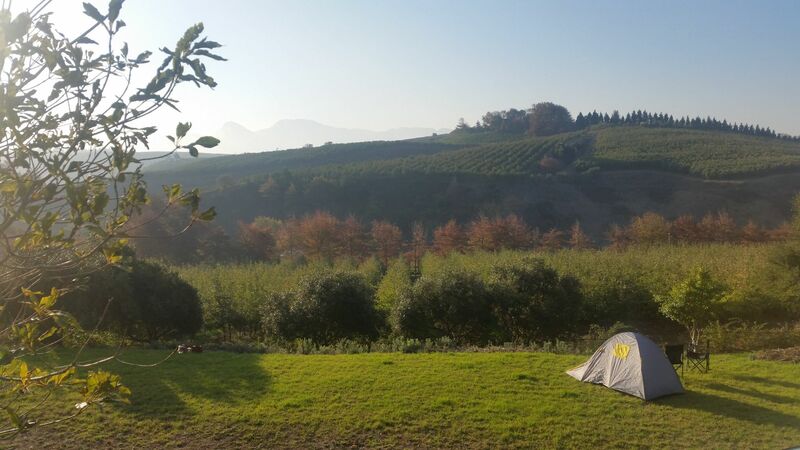 We found a great little campsite called Pippins Country Lodge. It took us an hour to get to it from Cape Town. On the way, we stopped at the local farm stall (Peregrine) to grab some braai meat and rusks.All the other essentials were already packed. When we arrived, we were greeted by a massive, friendly man with his two excited dogs. 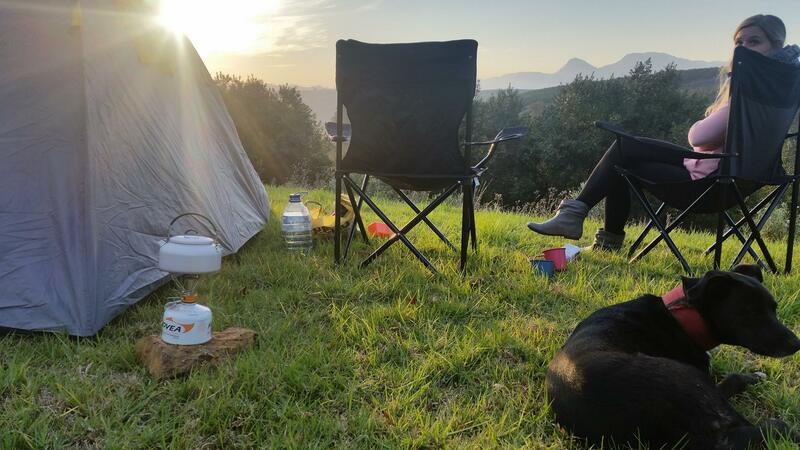 We were told that we could set up our tent anywhere we wished.After admiring the breathtaking views, we found a spot that faced the sunset and overlooked what seemed like a never ending valley of apple trees and mountains. After we had set up our site, we went for a walk through the valley. There seemed to be several trails veering off in all directions, and we had full access to the entire farm! We decided to light the fire and retire to our camping chairs in order to witness what can only be described as an epic sunset. After dinner, we decided to call it a night and slept under the very bright display of the Milky Way. The next morning, we awoke to the sounds of birds chirping and the faint sound of an apple farmer’s tractor in the distance. It was a cold, yet clear morning, but as the sun peeked from behind the mountains, we were greeted with a wave of warmth and comfort. With tea and coffee on the brew, we knew we had found a gem of a campsite. If it is simplicity that you seek, Pippins is the place for you. The country could have been in a state of disaster, and we would’t have even known. No electricity, no time, and no worries. A spontaneous, midweek getaway. We will be doing it more often. Very nice, did you guys go campin recently in the winter? Isn’t it too cold? They went in the early winter! But you know what they say, there no such thing as bad weather just inappropriate clothing!